Just before Matt Mendelsohn began work on his honors thesis in human health, he was hospitalized with a staph infection. His year-plus effort of grinding stems, leaves and roots of various blackberry species — then teasing the chemicals apart to isolate 55 different extracts in a bid to find one to help battle the bug that causes an increasing number of antibiotic-resistant infections — was now personal. Working from a similar breakthrough by his thesis adviser, ethnobotanist Cassandra Quave, Mendelsohn discovered that two root extracts, one from the common blackberry and another from a species of dewberry, help conquer staph’s defense system. Quave, an assistant professor in Emory’s Center for the Study of Human Health and in the School of Medicine’s Department of Dermatology, holds the patent on the compound she teased from the roots of an elmleaf blackberry that do the same. “When I first came to Emory, it was not my first thought to do research, but I definitely understand its importance to medicine,” Mendelsohn says. Those tools will be especially helpful to Mendelsohn in his planned career. He entered Emory on the pre-med track, expecting to major in math and either biology or chemistry. The human health major was just taking shape at the time. A pioneering program that links Emory’s diverse efforts in health education, research and the liberal arts, human health captured Mendelsohn’s attention instead. His first year on campus, he sought as many health and sciences classes as he could — earning induction into the Phi Eta Sigma freshman honor society for his efforts — and filled his time outside the classroom with club lacrosse and his fraternity, Zeta Beta Tau. 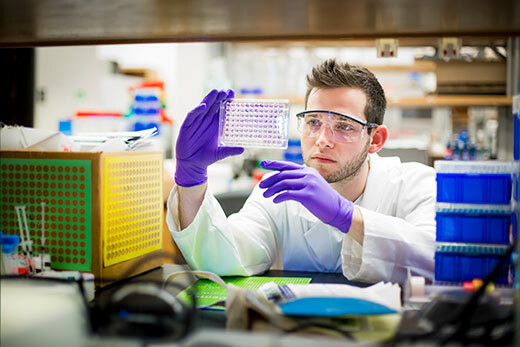 Mendelsohn, as the son of two doctors, was enjoying learning about nutrition and other components of health when his sophomore roommate Justin Robeny began raving about the deep science work being done in Quave’s lab. Quave 00C had made a name for herself by rigorously applying hundreds of years of knowledge of plant-based healing to tackle the public health crisis of antibiotic resistance. The Quave Research Group includes an interdisciplinary team of scientists and a handful of carefully selected students, all working on the antibacterial potential of plants. Quave requires her 25-30 student workers to have a strong science background as well as a willingness to volunteer for at least 10 hours a week for a semester, to prove their commitment and learn their way around the equipment. In her five years running the lab, she only oversaw three students’ work on an honors thesis. That is, until this year, when three more earned the honor — Mendelsohn among them. So what, exactly, did Mendelsohn do? The details are likely to be published, as was previous Quave lab research that included an undergraduate researcher. But broadly, Mendelsohn decided to see if eight other species in the genus rubus, the flowering plants we mostly know as types of blackberries, had similar success in beating back staph’s defense as one that Quave uncovered. Specifically, Quave found a refined fraction extract from the rubus ulmifolius (the elmleaf blackberry) inhibited formation of biofilm. The biofilm creates a protective layer over the bacteria, which can make them thousands of times more resistant to antibiotics. Mendelsohn pulled out different chemicals from different parts of each of his plants, grinding some of the tougher plant parts with equipment once used to grind dense horse hoofs. From there, he had to tease his crude into four different partial fractions, an intense amount of chemistry work to make extracts. Mendelsohn says he was spending about 20 hours in the lab weekly, just to get the extracts ready for step two: applying various concentrations of his extracts on microplates of staph bacteria. In that work, Mendelsohn was measuring for two things: would any of his assays affect the growth of the bacteria, and would any inhibit the biofilm? Together, he was looking for the extract that would not affect bacterial growth but would damage the biofilm. Though it sounds counterintuitive, that allows for a compound that can go after the biofilm, which is not an essential function of bacteria the way growth is, thereby preventing the development of future resistance. “In the long term, that would mean these could be used along with existing antibiotics, making them more effective for longer use,” Mendelsohn says. Other students in Quave’s lab have completed some of that process. But Kate Nelson, the biology lab manager where Mendelsohn did the final parts of his research, says his work falls in line with deeper research. One big question is whether his extracts could coat artificial implants, such as hip replacements, since bacteria easily latch onto their smooth surfaces and create problems. Mendelsohn is aware of the years of research still ahead for his findings, and he still plans on doing clinical work as a doctor. But his time in Quave’s lab has given him a new perspective on his gap year next year. He is spending it at the Tisch MS Research Center of New York, working as a lab research assistant on the causes and treatments of multiple sclerosis.